365 days. 365 cartoons. 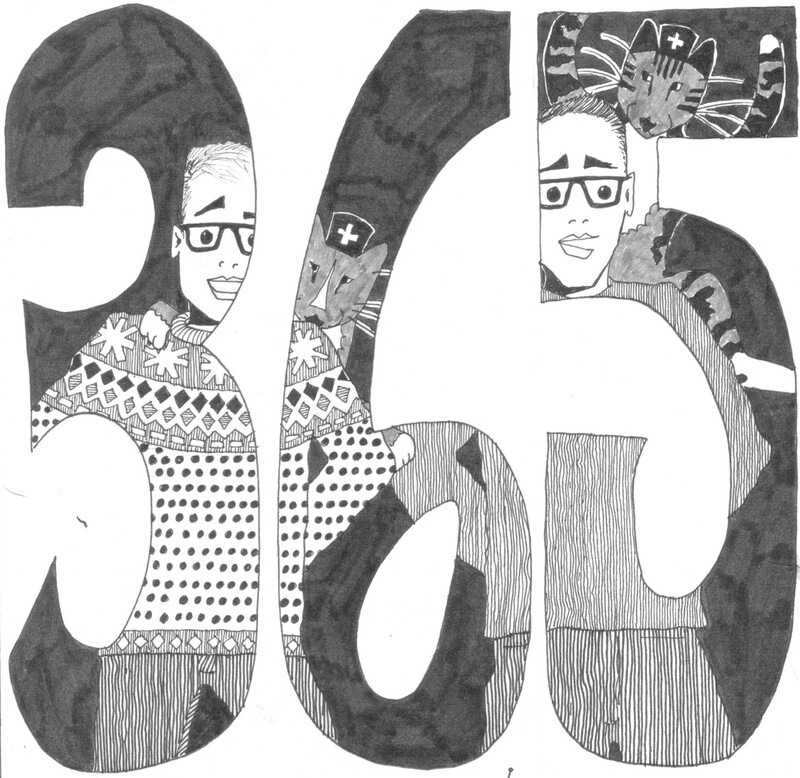 365 wonders. Yep Queenie has done it. She’s delivered. That sketchbook and pens I handed her to banish the demons as she sat sad and sorry in a hospital bed on January 4th 2014 has become something I could never achieve, something I’m so proud of and something, incidentally, we all look rather handsome in. 365 days of The Ouch House Diaries. From those early days of fear, worry and dread as we waited to see how broken she was, if the meningitis scare would materialise, if her fractured skull, snapped elbow, busted up inner ear and broken arm would ever repair to those early months of healing – frustrated, painful healing, to the glory of getting my missus back to the wonder she was, it was one hell of a year. Nights of Tramadol dreams, days of boredom (which sadist thought jigsaws were a good idea? ), those tentative first steps and consuming our own weight in well intentioned cakes and chocolate. The joy of relying on public transport (“I can use my phone to get on the bus!”), climbing the mountain that is Elm Grove, that first post-recovery wiggle and her regal DSD deck return. That fainting incident (I’m not quite the butch soul I thought I was), those baths with added bin bags and the numerous requests to scratch something she couldn’t quite reach. We’ve done it all. Medications permitting. And I’ve learnt it all. The kindness of strangers, the wonders of the NHS, the beauty of moments you thought you’d might not get again, the joy of good health and the basics we take for granted. The need not to mutter, the ability of a good tune to make everything better and the importance of two furry ones who cuddled her back to health. And the need for others, for friends, for family, for colleagues – for lifts, for meals, for assurance, for support and for love. Oh for the love. Thank you for the love. The love that made the ouch less, well, ouch. Thank you. From me and from the regal patient. We couldn’t have done it without you – and without you these past 365 days would never have provided Queenie with a reason to keep on cartooning on. All Ouch House like. All 365 days of Queen Josephine’s Ouch House Diaries are available here. From 5th January 2015 the Ouch House Dairies will be a weekly omnibus – like The Archers on a Sunday. Queenie’s Strip Service will continue bi-monthly in Gscene Magazine. Plus to celebrate a year of The Ouch House Dairies, Queen Josephine is creating an unique artwork starring each and every soul who has featured during the 365 days. It will be auctioned off later this month for The Sussex Beacon and Friends Of Brighton & Hove Hospitals. Follow us on Facebook and Twitter for more details.